In their effort to distance themselves from irrelevant and pathological forms of religion, many today are identifying themselves as “spiritual but not religious.” This general move across culture has also tended to brand religion itself as inherently irrelevant (outdated) and pathological (extremist and/or delusional). The so-called New Atheists have promoted this identification in their advocacy on behalf of science, humanism, and social progress. A problem with not only this more aggressive opposition to religion, but even with the self-identifier of “spiritual but not religious,” is that it’s based in a fundamental misunderstanding. It treats spirituality and religion as if they are two entirely different things – one private and personal, presumably; the other public and institutional. As a matter of historical fact, organized religions are losing credibility. A religion which is fundamentalist, anti-scientific, countercultural, and otherworldly is quite literally out of touch. But notice that I said “a religion which is” these things, not that religion itself is out of touch. Just as we wouldn’t want to identify science with examples of bad science (e.g., parapsychology) or quasi science (e.g., creationism) and summarily scrap the empirical enterprise of science altogether, neither should we confuse religion itself with its irrelevant or pathological examples and dismiss it all as dangerous nonsense. In this post I will make the case that while religion itself needs to be distinguished from its cultural (good or bad) examples, it also needs to be understood as inseparable from spirituality – another term which I’ll attempt to define more carefully below. My diagram illustrates a watercourse flowing left-to-right, with the picture divided in the two dimensions of “outer” and “inner.” This is meant to correspond to a most fundamental and obvious fact, which is that consciousness opens simultaneously in two orientations: outward through the senses to a sensory-physical reality, and inward by contemplative intuition to its own grounding mystery. As the executive organ of your sentient nervous system, your brain is constantly monitoring information coming through its senses from the external environment. By the process of perception it represents a relevant and meaningful picture of reality called your worldview (or simply your world). At the same time, your brain is receiving information from your body’s internal environment and gathering it into a gestalt intuition called your self-concept (or simply your self). Self-and-world is the integral construct by which you, moment by moment, work out the meaning of your life. A secondary function of religion at the cultural level (suggested in the Latin word religare, to link back or connect) is to unify the disparate objects and fields of perception into a world picture that will orient its members and make life meaningful. For many millenniums religion succeeded in this enterprise by telling stories, which it draped over the frame of reality as people have understood it. With the rapid rise of empirical science, however, that cosmological frame underwent significant remodeling, with the result that many stories no longer made sense. So, if putting together a coherent world picture that makes life meaningful is the secondary function of religion, what is its primary one? The two distinct dimensions of your existence, then, are the world of meaning where you play out your identity, and the ground of being which supports and animates your self from within: Outer and inner. Hopefully now you can see that these two dimensions of inner and outer are not separate “parts” of you, but two distinct orientations of consciousness – outward by observation to the larger world of meaning, and inward by intuition to the deeper ground of being. Just as the outside and inside of a cup cannot be separated from each other, so your outer life cannot be separated from your inner life. They are essentially one, as you are whole. I have made this personal so that you will have a vantage point and frame of reference for understanding the relationship of religion and spirituality. Translating directly from your individual experience to the cultural plane, we can say that religion is a system of symbols, stories, and sacred rituals that articulate a world picture in which people find orientation and meaning. This world picture must be congruent with the frame or model of reality generally understood from empirical observation – as we might say, based in the science of the time. 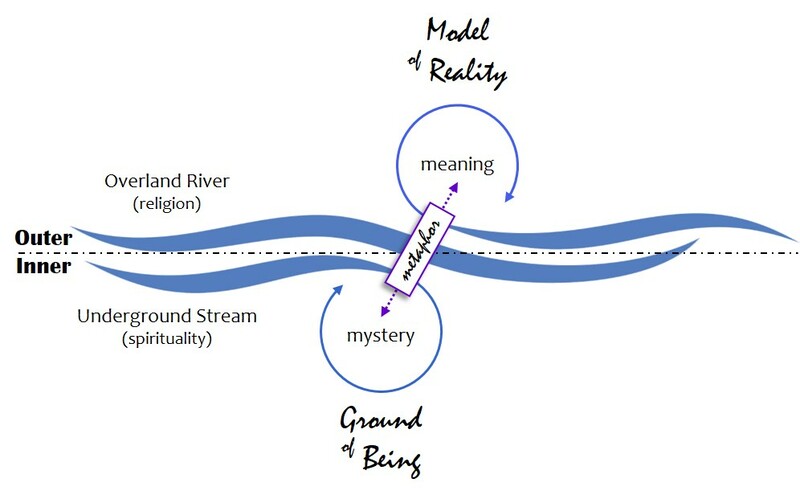 In my diagram I have identified religion as an overland river which carries the heritage of beliefs, values, and practices that preserves the meaning of life. In providing this structural continuity, religion stabilizes society by orienting and connecting its members in a cohesive community. However, as with your own experience, if this outer production of meaning should lose its deeper link to the underground stream of inner life, it quickly withers and dies. Spirituality is my name for this underground stream, and it is the fuse by which religion is energized. Whereas religion’s commitment to meaning (and meaning-making) makes it articulate and rational, this engagement of spirituality with the grounding mystery renders an experience which is ineffable (i.e., beyond words and inherently unspeakable). Throughout cultural history these two traditions have been moving in parallel – one outwardly oriented, institutional, and theological in character (i.e., given to talking about god), and the other inwardly oriented, contemplative, and mystical (preferring to be silent in the presence of mystery). The overland river of religion gives expression, structure, orientation and meaning to life, as the underground stream of spirituality brings individuals into communion with the provident ground of their own existence. Outwardly religion articulates this deep experience of mystery, while inwardly spirituality surrenders all meaning, the urge to define, and the very self who would otherwise satisfy this urge. Religion and spirituality are therefore not separate things, but dimensions of the one watercourse of our human experience. As my diagram shows, the place where the overland river and the underground stream come closest (though without merging) is in metaphor, which, as the word itself suggests, serves the purpose of carrying a realization born of experience across this gap and into the articulate web of language. The ineffable mystery is thus given form. The dark ground of being is represented in translucent images that give our rational mind something to contemplate. God as fire, god as rock, god as wind, god as father or mother, god as lord and governor, god as creator of all things, even god as the ground of being – all are prevalent religious representations of a mystery that cannot be named. As metaphors they are not meant to suggest that one thing (the grounding mystery of existence) is like another thing (a rock, a person, or the ground we stand on). In other words, these are not analogies between objects or similes by which two unlike things are compared (e.g., she is like a rose). Metaphors in religion are word-images that translate an ineffable experience (of mystery) into something we can talk about (our meaning). As the mystics patiently remind us – but sometimes with greater admonishment: The present mystery of reality is not some thing (or someone) out there, over there, or up there. It is not a being, even a greatest of all beings. The god of myth and theology does not exist as we imagine, and we should not presume to speak on behalf of a deity who is our own creation. Speak of the mystery if you must. And “tell all the truth, but tell it slant” (Emily Dickinson).